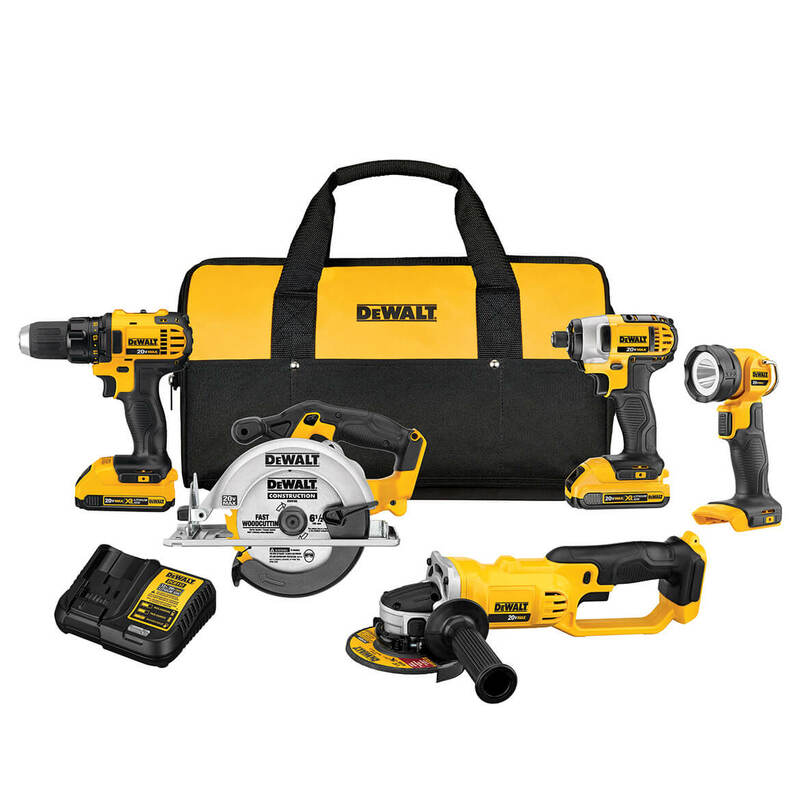 DEWALT 20V MAX Compact 5-Tool Combo Kit (2Ah) features our 20V MAX Lithium Ion Compact Drill / Driver which is lightweight and compact for working in tight spaces for long periods of time. The 20V MAX Lithium Ion 1/4 In. Impact Driver is compact and lightweight for fitting in tight spaces and increasing productivity. The 20V MAX circular saw with 6-1/2 In. carbide blade can cut 2x4's at a 45-degree angle in a single pass. The 20V MAX XR Lithium Ion 4-1/2 In. / 5 In. Grinder increases productivity with features like Quick-Change wheel release, convenient trigger switch with lock-off button, and extended run-time battery. The is a bright flashlight to illuminate your work area with LED output of 110 lumens. Compact, lightweight design fits into tight areas. High speed transmission delivers 2 speeds (0-600 and 0-2,000 rpm) for a range of fastening and drilling applications. Ergonomic handle delivers comfort and control. 1/2 In. ratcheting chuck provides superior bit gripping strength. Compact (5.55 In. front to back) design fits into tight areas. 3 LED lights with 20-second delay after trigger release, provide visibility without shadows. One-handed loading 1/4 In. hex chuck accepts 1 In. bit tips. Belt hook included for portability. 6-1/2 In. Carbide blade can cut 2x4's at a 45-degree angle in a single pass. 8,000 rpm motor provides high power for cutting and grinding applications. Quick-Change Wheel Release allows for tool free wheel changes without the need for a wrench. Tool-free guard allows for quick and easy guard adjustments/positioning. 2-finger trigger switch with lock-off button for convenient activation and easier gripping. 2-position side handle offers greater control, comfort and versatility. Bright LED output - 110 Lumens. Integral hook for hands-free use in multiple placements. Low heat output compared to Xenon lights. Efficient LED bulb improves run-time. 11-25 hours of run-time depending on battery amp hour. All items are covered by manufacturer warranty. Most orders ship within 2-3 business days via FEDEX Ground shipping. All our sales are backed by a 30-Day Satisfaction Guarantee. Factory Authorized Outlet. All rights reserved.